Wedding Suite includes four different templates with quite unique design. It comes with RSVP Form, Countdown and Guestbook. Wedding Suite is a premium, fully responsive, Retina-Ready WordPress theme with a minimal and clean design. It’s very code-light, making it quick to load, and has a pleasingly clean look that’s ideal for wedding websites. Wedding Suite is fully integrated with the visual composer. Code is easy to modify and understand so you can personalize it in the easiest way. 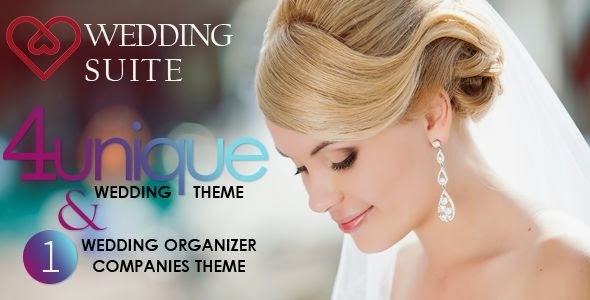 Item Reviewed: 4 in 1 Beautiful WordPress Wedding Theme 2015 9 out of 10 based on 10 ratings. 9 user reviews.